Iroquois traditional dances are one type of Native American dancing, which has a lush history of folklore and tradition that endures today. 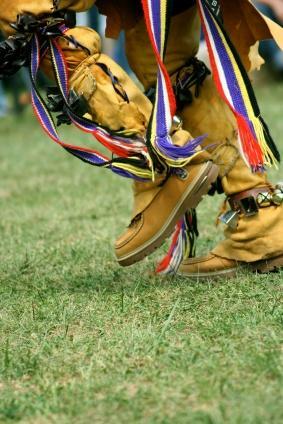 Many Iroquois steps have been preserved and passed down to young generations from Earth Songs like the Rabbit Dance, allowing today's Iroquois to enjoy a unique fusion of cultural dancing and family tradition mixed with modern artistic expression. The Iroquois tribes, which are made up of various groups including the Mohawk Indians, have several traditional social dances in their culture. Much like patrons at a dance hall today, the tribes loved to get together to dance, sing and enjoy each others' company. Many of the social dances were referred to as Earth Songs in Iroquois life. Iroquois socials are community gatherings that encourage everyone to dance the traditional dances of the Earth Songs. Each song varies in speed and complexity, but all dances are performed in a counter-clockwise direction. Almost every dance will be given to the announcer of the social, and the dance is then introduced in the native tribal language of the announcer. The announcer also serves as a "caller", similar to the leader found in square dancing, providing instructions to the dancers as they move along to ensure everyone stays on beat and doing the correct steps. Stomp - the feet shuffle across the floor with the right foot in the lead. The left foot is brought up to rejoin the right as the dancer moves across the floor, and the feet hit the floor hard enough to help carry the beat of the music to all dancers. Side-Step Shuffle - this foot shuffle and stomp is performed only by female dancers. The women alternate shuffling their right and left feet across the ground. Fish - The fish dance step involves each foot hitting multiple beats. Instead of alternating feet, the right foot may stomp two or three times to the music before switching weight to the left foot. These three beats are worked into several different Earth Songs, most of which feature basic choreography that a beginners can easily learn at a social. Each of these dances tells a story related to the title of the dance. There are extensive legends surrounding most of the Earth Songs; the Rabbit Dance is one of the most legendary tales. The story of the rabbit is set in ancient tribal times, telling the tale of a a group of hunters out looking for game. Just when they thought they could not find any animals anywhere, they found a rabbit larger than anything they had ever seen. Just as they were about to shoot the rabbit that was surely large enough to feed the entire village, the leader of the hunters had them lower their weapons and wait to see what would happen next. The legend maintains that the hunters watched as the large rabbit thumped its foot on the ground. Other rabbits began to hop toward it, and they too came and thumped their feet in time, completely ignoring the threat of the hunters. The rabbits formed a big circle and began to dance. The dance was so captivating that the hunters ran back to their village and told the story to their Clan Mother, who listened carefully as they reenacted the rhythm for her on water drums. She then proceeded to tell the hunters that the rabbits knew that the Iroquois depended upon them for food and clothing. They had taught the hunters the dance that day to show them a way to express gratitude and reverence toward the rabbits for all they continue to give. To this very day, the Rabbit Dance is done as a sign of thankfulness to the rabbit people for all they have brought to the lives of the villagers. The Rabbit Dance is a good example of how Iroquois traditional dances tell a meaningful story that celebrates the hunting and gathering culture of the Native Americans. Learning such traditional dances, and the tales they tell, allows both young members of Iroquois tribes, as well as young people of other ethnicities, the opportunity to appreciate the culture of a traditional people steeped in culture and their respect and reverence for the world around them.